Japanese media reported that nearly 200,000 homes were without electricity, and that drinking water systems had also failed in the area. TV video showed people huddled in blankets, sitting or lying down shoulder-to-shoulder on the floors of evacuation centers. An estimated 400,000 households were without running water. 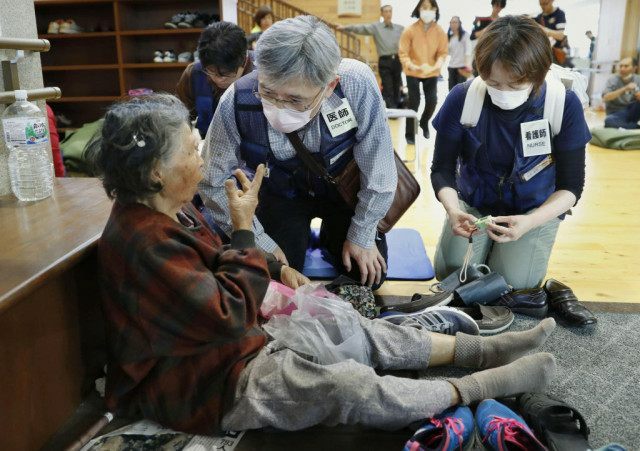 Chief Cabinet Secretary Yoshihide Suga said that 1,500 people had been injured in the quakes. Tajima said that 184 people were injured seriously, and that more than 91,000 people had been evacuated from their homes. More than 200 homes and other buildings were either destroyed or damaged, she said. Prime Minister Shinzo Abe expressed concern about secondary disasters as forecasters predicted rain and strong winds later in the day. With the soil already loosened by the quakes, rainfall can set off mudslides. “Daytime today is the big test” for rescue efforts, Abe said. Landslides have already cut off roads and destroyed bridges, slowing down rescuers. Police received reports of 97 cases of people trapped or buried under collapsed buildings, while 10 people were caught in landslides in three municipalities in the prefecture, Japan’s Kyodo News agency reported. The quakes’ epicenters have been relatively shallow — about 10 kilometers (6 miles) — and close to the surface, resulting in more severe shaking and damage. National broadcaster NHK said as many as eight quakes were being felt an hour in the area.